The MORGAN PIVOT POLISHER is designed to fit a Sherline lathe, and most watchmaker's lathes however, if you have a different type of lathe that requires a custom fit, call us we maybe able to help you out with a fitup. One of the easiest to use and most versatile pivot polisher ever produced. Designed to fit a Sherline lathe, and most watchmaker's lathes. Will polish pivots from small French clocks to large Grandfather clocks. Solid carbide polishing wheel will give you the best possible finish. Complete ball bearings on all rotating shafts. Compatible with all bushing systems. 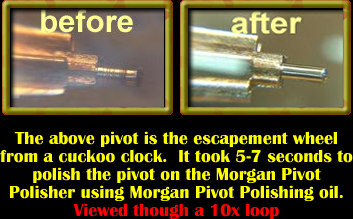 THE MORGAN PIVOT POLISHER WILL SAVE YOU TIME. IT ALSO REDUCES THE FRICTION IN THE MOVEMENT WITCH GIVES YOU A HIGHER QUALITY REPAIR.